So, I don't order many things...but when I do I am pretty picky about what it is I am buying. I had been hearing about JewelMint for some time now and finally decided to check it out. For those of you who are not familiar, Jewelmint was created by Celebrity stylist Cher Coulter and actress Kate Bosworth. The first step is to take a free style profile where you choose different styles, colors, and items that you like. Once you have taken the profile, JewelMint sends you your personalized jewelry collection for the month. As a member you get access to exclusive jewelry collections each month for $29.99. Shipping is FREE, and you can return items without any hassle. Now...let's face it...anything that says there is a membership pretty much turns me away...I mean who has $30 a month to spend on jewelry...ok, maybe we do...but we don't always want to...so at the beginning of every month you just log in and Skip that month essentially opting out...No charge...There’s no obligation ever. 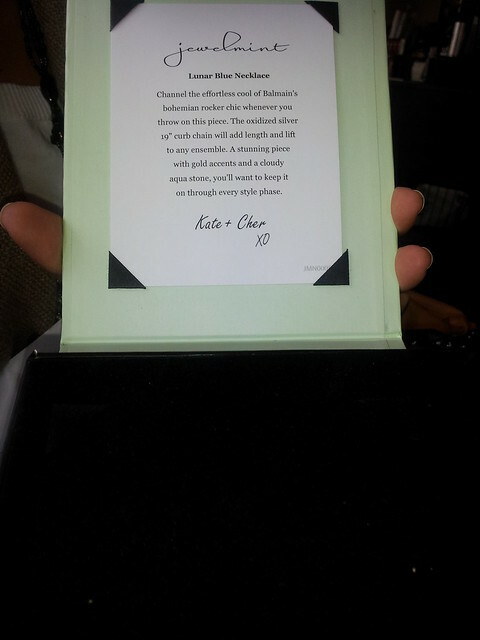 Look at this little description of the piece, LOVE this! AND I got a free gift!! 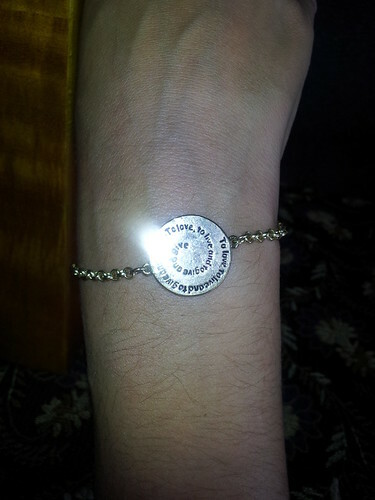 The humanity bracelet..such a great message...! All in all...the packaging, the necklace, and the experience was pretty awesome..and I am not being paid for this nor was I given the jewelry...so...haha it's for reals folks! I am not sure how many pieces I will buy...but I can't wait to see my October Showroom! Have you guys bought anything from Jewelmint? Happy Shopping! 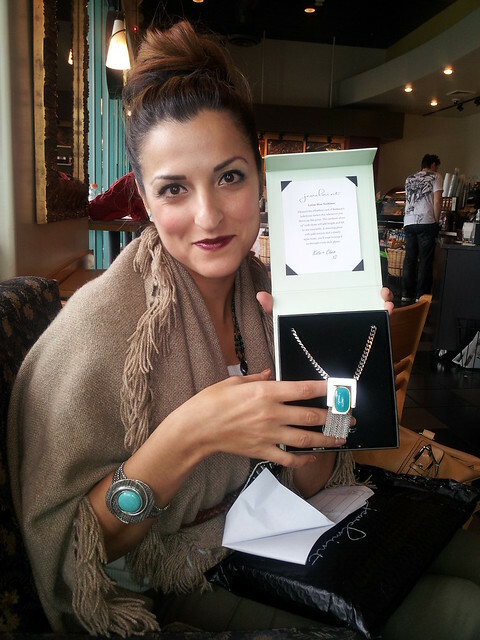 Share pics of your Jewelmint pieces on my facebook HERE, would love to see! I have been wanting to try Jewelmint for a while now, so thank you for giving me a little kick! That necklace is gorgeous! I have a few pieces, it's becoming an obsession. I know it has nothing to do with the jewelry, but I love their packaging! It's so pretty and expensive looking! Can I just say that your makeup is FLAWLESS? Your face looks soft and pretty. You should totally do a beauty post some time. I have seen these jewelminters before and it always looks like good stuff. If I had a real gig I might invest. I'd like to say that I was thinking about you the other day and decided it wouldn't matter if you put on the most hideous hobo stained blanket, you could make it look good. You are gorgeous Shana but Im sure your hubby tells you that all the time and you dont need some freaky blogger girl telling you. Well, thats what I thought haha. Seriously, you look SO elegant and glamorous in these photos. Thanks for sharing your new jewelry! It's beautiful. And did you know your new necklace would totally match that awesome bracelet you're wearing? Thank you so much for the suggestion of jewel mint! 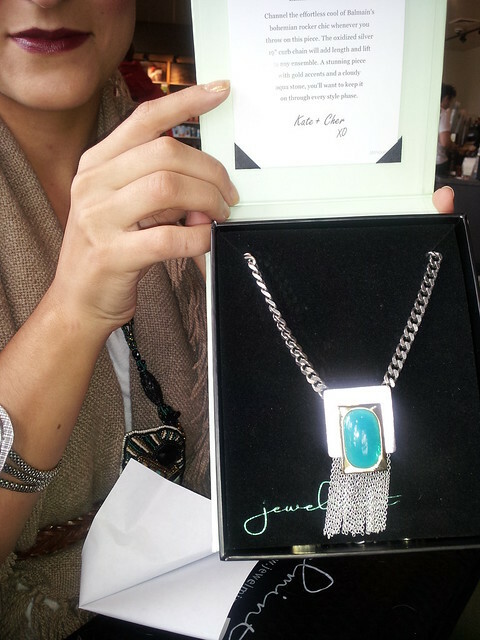 I do have to say I love the turquoise necklace along with the bracelet you are wearing. They go so well together for two different pieces. I wanted to try them too! I am doing that this weekend!!! GIRL! You make me want to sign up too! I like you have seen the advertisement and always thought it would be fun too...I may just have to look into it! OOH, this is your blanket poncho, isn't it?!?!?! LOVE IT!! haha you guys are awesome! haha and yes...it IS the blanket! !